Freshly cut and bound wreaths in various sizes. Some simple and green, others ornate with berries, pinecones and bows. 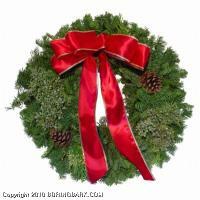 A wreath for everyone!